Built on a foundation of hard work, Harbison & Hoyt LLC is dedicated to providing high-quality professional services and determined to achieve exceptional results for our clients. Put our lawyers to work for you. 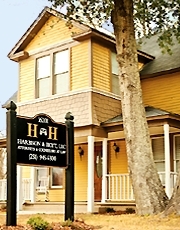 Harbison & Hoyt LLC is a general practice law firm serving the legal needs of the Alabama Gulf Coast. Our law practice ranges from civil to criminal and from transactional to trial. Our primary goal at Harbison & Hoyt LLC is to provide the client with exceptional legal services and solutions to real life problems. Our attorneys accomplish this goal by focusing on our clients objectives and aggressively pursuing those objectives in a timely and cost-effective manner. From the simple to the complex, our firm approaches every matter with the same level of results-oriented service. Some of the areas in which we practice law are Divorce, Family, Criminal, DUI, Business, Construction, Real Estate, Collections, Wills, Trusts, Accident and Injury. To see more of the legal issues our firm handles visit the Practice Areas. To learn more about our lawyers visit the Attorney Profiles. In Alabama, we serve: Daphne, Mobile, Fairhope, Spanish Fort, Orange Beach, Gulf Shores, Summerdale, Foley, Loxley, Robertsdale, Bay Minette, Elberta and Silverhill. If the law firm of Harbison & Hoyt, LLC can be of service, contact us today at 251-945-5300.